Begin by creaming the butter and sugar..
add eggs, one at a time..
Preheat the oven at 350 F degrees. Butter and dust the pan with flour, tapping out the excess. In a bowl, whisk the flour, baking powder, and salt to blend them. In another bowl, toss the mini chocolate chips with 2 tablespoons of the flour mixture; set aside. In an electric mixer, beat the butter at medium speed for 3 minutes. Add the granulated sugar in 3 additions, beating 1 minute after each addition. Beat in the eggs, one at a time, followed by the vanilla extract. With the mixer set on low speed, add the flour mixture in 3 additions alternately with the buttermilk, beginning and ending with flour. Scrape down the bowl often with a rubber spatula. Remove the bowl from the mixer stand. With a large spatula, stir in the chocolate chips. Spoon the batter into the pan and smooth the top. Bake the cake for about 45 to 50 minutes or until a skewer inserted into the middle of the cake is clean when withdrawn, and the cake pulls away from the sides of the pan. Set the pan on a wire rack to cool for 10 minutes. Carefully invert the cake onto the rack to cool completely. Cool completely before slicing. If you want, you can dust the cake with icing sugar or pour chocolate glaze over. Enjoy! 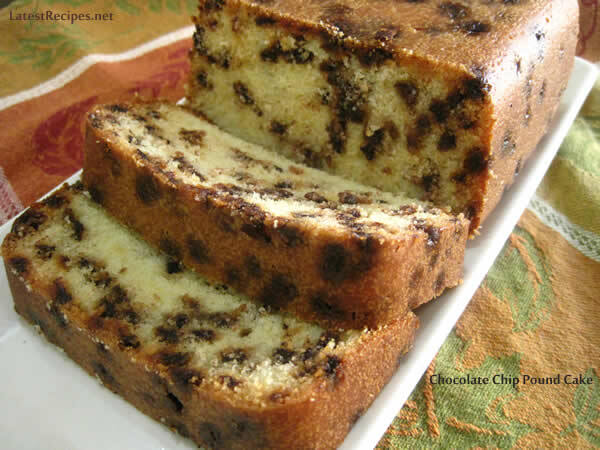 3 Responses to "Chocolate Chip Pound Cake"
I love pound cake and who can argue with chocolate chips! I love how they didn’t all sink to the bottom. Must be coating them with flour that prevents “sinkage”.